On this page you will find links to resources and information about gangs in BC, ways to prevent youth gang involvement, how to get help, and a calendar of events. The resources are an opportunity to share valuable information, training and educational opportunities with the public, or segments of the public. Visit End Gang Life to watch and incorporate into conversations about gangs, drugs, and crime prevention and education. Children of the Street Society takes a collaborative and comprehensive approach to preventing the sexual exploitation of children and youth. We know that investing in preventative measures means a decrease in the need for intervention and enforcement services, and is cost-effective over the long-term. We offer a variety of preventative programs which engage a diverse range of individuals and groups. Our primary prevention tool is education and awareness workshops – we facilitate over 500 workshops, in approximately 30 B.C. communities, with more than 25,000 participants annually! Crime Stoppers is an independent non-profit society and registered charity managed by a civilian Board of Directors working in partnership with the police, the media and local citizens. As an organization, Crime Stoppers is a vehicle that allow citizens to ANONYMOUSLY supply the police with information about a crime or potential crime of which they have knowledge without fear of reprisal. 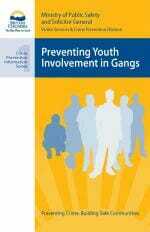 The Youth Gang Prevention Toolkit for Community Planning, and its accompanying Quick-Start Guide, are designed to assist service providers, community leaders, and others who are working to help prevent youth from becoming involved in gangs or to help them leave gangs. The toolkit was developed with the assistance and partnership of many stakeholders, including the Community Action and Assessment Networks, Alberta’s Ministry of Justice, and the federal government. The Youth Against Violence Line was established in the early 1990’s as part of the Taking A Stand campaign, an initiative of the B.C. Government. The campaign was designed to encourage young people to take an active role in preventing violence amongst their peers. At that time, the YAV Line offered a voicemail and e-mail service where callers could be connected to the police to anonymously report incidents of youth violence and crime, without fear of reprisals. Headquartered in Metro Vancouver, CFSEU-BC is represented in all the main regions of the province with offices in Kelowna, Prince George, and on Vancouver Island. In 2004, CFSEU-BC was developed in consultation with the Provincial Government. The intent was to integrate the Organized Crime Agency of British Columbia, municipal police and the RCMP into one combined unit to coordinate the province’s response to the growing threat of organized crime and gang violence. CFSEU-BC is made up of seconded police officers from the following Police Departments & Organizations.